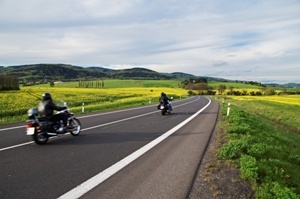 Drivers Can Help Prevent Fatal Motorcycle Wrecks | Holland & Usry, P.A. Car and truck drivers can be annoyed by motorcycles—but the truth is, motorcyclists have just as much a right to the road. And they have every bit as much a right to be safe. Federal safety research data shows deadly traffic accidents result from drivers not looking out for motorcyclists. As we’ve reported before, car and truck drivers cause serious injuries to innocent motorcyclists by ignoring basic safety rules of the road. Data compiled by the National Highway Traffic Safety Administration (NHTSA) in 2004 and 2012 shows a high number of fatal motorcycle–passenger vehicle crashes resulted from cars or trucks turning left while a motorcycle went straight. In 2004 these wrecks comprised 39% of all such fatalities, and in 2012 it bumped up to 41%. In traffic terms, this often means the other vehicle failed to yield the right of way. In motorcycle accidents, it can kill. Here’s how motorists can help prevent lethal wrecks. Remember motorcyclists are people too. They are parents, children, co-workers, friends, and neighbors, just like you. Keep ’em safe. Look twice, save a life. Look out for motorcycles, especially if you can’t see them. Because they’re slim, they can easily get in a car’s or a truck’s blind spots. Take a couple more seconds to check next to you when you change lanes or ahead of you as you go through an intersection. Presume the motorcycle is closer than it looks, especially if it’s approaching an intersection where you’re about to turn left. A motorcycle’s small size creates the illusion it’s further away than it is. For the same reason, the bike’s speed can be deceptive—it may be going much faster than you think. Give MORE following distance than you would for a car. Believe it or not, a motorcycle’s stopping distance is about the same as a car. Riders often slow without using their brakes at first, so you can’t rely on a brake light to show you they’ve reduced speed. Don’t rely on a motorcycle’s turn signals. These often don’t turn off automatically after a turn. Never assume a motorcyclist is turning, so you can speed up and blow past. It could be that the rider has no intention to turn, but he just forgot to turn off his blinker. We take pride in helping motorcyclists who have been hurt when drivers ignore them or their safety. When that happens, the consequences can be devastating for riders. If you’ve been hurt in a motorcycle accident—or worse, lost a loved one in a motorcycle crash—feel free to start a live chat or send us an email to answer your questions about your rights. We can help you out with the confusing hassles of the insurance system so you can focus on recovery and have peace of mind. If you have any other questions about traffic accidents, you should download our free report that answers lots of questions folks have asked us over the years. And you can always use this website—where we answer even more questions—to point you in the right way.